The Joys of Trade Chat #WoW – Nomadic Gamers, eh! 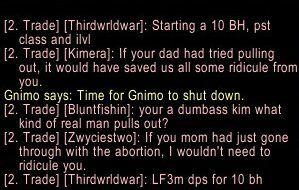 It doesn’t matter what server you play on, whether you’re alliance or horde, trade chat tends to look like this. I’d love to turn this channel off but WoW lacks any proper server wide channels which makes finding groups on your own server (RBG anyone?) all the more difficult. I really wish they would implement level specific channels, or even a general channel that was server wide aside from trade chat which you can only access while in cities. I’m a bit surprised that they haven’t yet. Oh, you can go ahead and turn it off. WoW is currently designed where there is, in fact, no need to group at any point until end game raiding. All of the leveling content is designed to be accomplished in solo play, and in fact many of the quests fail if you attempt them in a group, as my wife and I found. Dungeon running is currently designed to be short content accomplished by five strangers joined together by the random dungeon finder, and since these are taken from a pool of players though your entire battlegroup, you are unlikely to ever see any of them again in your gaming career, and can neither chat with them nor group with them deliberately in the future. You *can* queue for dungeons with friends, and run entirely as a five man group if you feel so inclined, but you won’t get better players forming your group of of Trade than the Dungeon Finder would provide. Running with Guildies is a different experience entirely, of course, but you won’t need Trade to be active for that, either. I honestly can’t think of a single downside at any point to leaving the Trade channel, unless you’d like to PuG a raid like Baradin Hold in the example above. But Raid Finder is coming in the next patch, which will remove even that last dribble of required social organization. I guess I sound bitter. But the depersonalization of WoW is what has lead to us to discover EQ2 (and your blog, for that matter). EQ/EQ2 have their own problems, of course – but even the 1-9 channel doesn’t have the constant, juvenile crudity found at any hour in WoW’s Trade. Any channel that can be global will soon be co-opted for the use of the attention-starved. It’s a sad but true fact of life in any MMO that is made going forward.